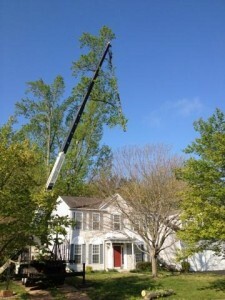 Professional tree removal will almost always involve equipment out of reach to the normal consumer. Trees seem pretty simple—bark, leaves, fruit, squirrels lurking and screaming at you from the branches, sets of eyes peeking at you from holes, mold, fungus, potentially deadly branches just waiting to fall. Okay, trees don’t seem so simple after all. Tree removal is a job that is definitely best left to professionals, and here are some of the best reasons why (not including squirrels screaming at you). Power lines are incredibly risky to work near, and that’s why the people you see working on them wear safety gear, use special equipment, and use the right tools for the job. If you are doing any work near power lines, you should always assume that the wires are live. No pressure, but if you, your saw, or your tree hits a power line in the course of your DIY tree removal, you might just knock out the power in your entire neighborhood or knock out the power and suffer horrible injuries. Like we said above, professionals have the right equipment for the job, that’s why they’re professionals. The Occupational Safety and Health Administration requires professional removal experts to wear the right protective gear. Tree removal experts also know how to use chainsaws, ropes, cranes, and wood chippers and they use them every single day. If you try tree removal on your own, you will not have any of the mastery or skill that a master tree removal specialist has. Sure, you can always Google “how to identify a dead tree,” but that has nothing on decades of experience. A dead tree decays from the inside out, so unskilled observers cannot tell they are about to chop into a tree that might fall or collapse over. A professional, however, will know the signs to look for and be able to do a much safer job. Tree Removal from Nelson Tree Specialist! This entry was posted on Friday, February 24th, 2017 at 4:22 pm. Both comments and pings are currently closed.